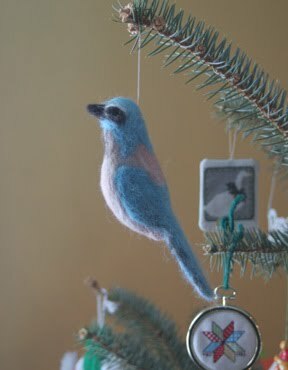 Bethany Homecrafts Upcycled Designs: Back Again! I offer up the humble prayer that your holidays have been filled with beauty, joy and peace. After too long away, again, I'm back, hopefully on a regular basis for the next few months. I've found I'm not able to hold together the busy market season, the sewing and felting, the schooling and the household work all at once, which explains the long absences. I have a much slower market and show season for the next months, thus my hope to show up here more often! The Boy has loved this bird and coveted it for a couple of years now. Its photo lives on the page opposite the Eastern Blue Bird that I often felt, and each time he's seen it I've been begged to make it. The photo in my guide is not very complimentary, so I've never been drawn to felt it. This year seemed the time to finally do it, so I pulled out my other bird book and found that the markings are quite a bit nicer than the photo shows, and here he is! 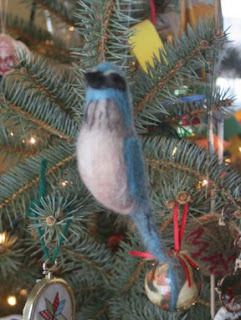 Our tree is covered in ornaments that I've made, the kids have made, and those we've received as gifts, many handmade. It's eclectic, homey and very fun! My mom and dad are not able to get out and Christmas shop anymore, so I help out as much as I can. 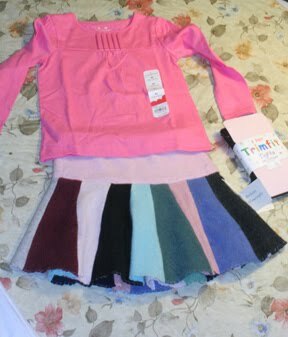 This year Mom wanted to give her great-grand baby an outfit including a skirt I'd made, so here it is. It had to be cashmere, of course! Now, lunch and shoveling out from our blizzard! We love the bird on the tree. Sarah wore her skirt for Christmas eve. Happy Christmas to you all.